Terasic HDMI-FMC is a HDMI transmitter/receiver daughter board with FMC (FPGA Mezzanine card) interface. The user can connect the HDMI module with the FPGA development kit via the FMC connector for HDMI image & video capturing, processing and displaying up to 4Kx2K@30fps resolution. The HDMI-FMC provides both the HDMI Tx and Rx Module with the HDMI 1.4a features supported. The Tx module is able to support most common standard and non-stand video input format, most common 3D formats and the video resolution up to 8-bit 4K(30Hz)、12-bit 1080p(60Hz)、12-bit 720p/1080i (120 Hz),and 16-bit 1080p (30 Hz). The audio interface supports S/PDIF, DSD , I2S and HBR audio format input. The Rx module is able to support all mandatory and additional 3D video formats and extended colorimetry (sYCC601, Adobe® RGB, Adobe YCC601, xvYCC extended gamut color CEC 1.4-compatible) with up to 36-bit Deep Color. The audio interface supports SACD, DSD, I2S and HBR audio format output. 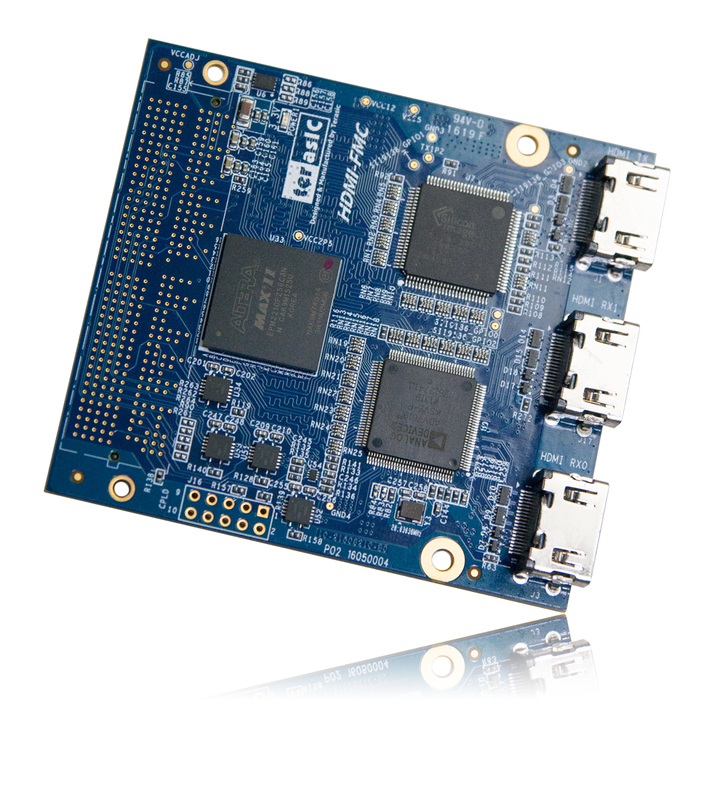 We do provide complete demo for the HDMI-FMC working with different FPGA development kits. These demos are created by using RTL & ALTERA VIP, by referring these demos; users can quickly develop their applications.